Pencil pleat curtains are offered in countless varieties so there’s sure to be something to suit every home. If however you’re unsure whether they’re right for you, then be sure to check out our overview of the style. If you’ve already decided that they would make a good match for your home, then you might be wondering something else – how to hang them. Here, we’ll run through pencil pleat curtain installation, so you can hang yours without a hitch. An important thing to remember when measuring up for pencil pleat curtains is that you’ll need to allow room for the pleats. With tightly-packed folds running across the length of the curtain, it’ll need to be much longer than it would if the fabric were pulled taught. As such, you’ll want to pull it taught before measuring. 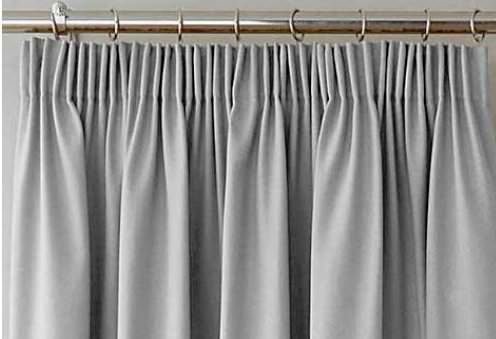 Fitting pencil-pleat curtains to a pole will require that you allow a bit of space on either side of each curtain so that they can convincingly overlap. For best results, measure the pole while it’s in position. Divide the total width by two and add ten centimetres. This is the width of each curtain. Running through the heading will be a set of loose strings. By pulling these, you’ll be able to bring the pleats together and thereby adjust the width of the curtain. Before doing that, tie them into a loose knot and stuff it into the pocket just below the top of the curtain. If there isn’t a pocket, then simply stuff it into the gap between the tape and the curtain. You’re now ready to start pulling. Hold the strings at the end you didn’t tie up and gently pull the tape at the top of the curtain until you’ve arrived at the right width, then tie up the remaining set of strings. Ensure that the pleating is evenly spread across the width of the curtain, and insert the hooks. You want these at regular intervals of around four inches. Finally, it’s time to hang the curtains. When doing so, ensure that you’re standing on a suitable surface. A short stepladder is ideal, though a kitchen chair will do if that’s all you have available. Can Pencil Pleat Curtains Go on a Pole? One of the key advantages of a set of pencil pleat curtains is that they will match existing curtain poles. If you’re replacing a set of eyelet curtains, then you might find that pencil pleat curtains hangs a little lower, but provided you’ve measured up correctly, this shouldn’t be too much of an issue. Hanging pencil pleat curtains on a track will result in a slightly different look. The process is the same as with a pole, except that instead of attaching rings, you’ll be attaching hooks which fit around little hoops on the track.